This is the smallest, but also the most wonderful Tee Dee (at least for me). It turns up to 30000 1/min on its 3 x 1.25 prop. 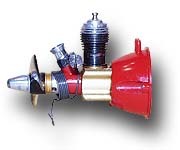 The TD engine line is based on the design ideas of Bill Atwood and appeared in 1961. 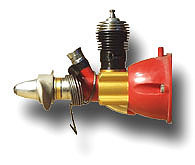 The engine was produced starting in 1960 until 1978 with gold anodized crankcase and propeller driver and red plastic parts. Production was sporadic, depending on sales. Since about 1989 newly manufactured aluminum parts were anodized without dying and the new plastic parts were molded in black. Also the steel spray bar was not treated with the initial black oxide finish anymore. 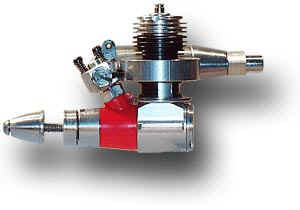 This is a larger (twice the Tee Dee .010 displacement) and more powerful Tee Dee, which has been used for small C/L as well as R/C models. The box contained the fuel tank shown in the picture and an replacement plastic backplate to mount the engine flat on a firewall. The engine performs much better than the .020 Pee Wee. This is the standard version of the powerful .049 Tee Dee. 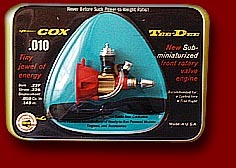 The Tee Dee line was introduced by the end of 1960 and formed Cox' competition engine line. Since circa 1973 a wire screen was placed over the venturi intake. This Tee Dee has been modified for free flight models. 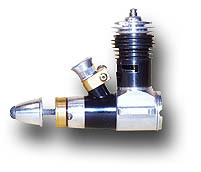 A chromed crankshaft reduces friction and a flooding line was added to the carburetor to stop the engine in fractions of a second. The backplate has a tap to pressurize the fuel tank, the head has been reworked and the enlarged venturi is fitted with a fine thread needle valve. The blue anodized spinner was added to make the engine with its internal differences stand out from the crowd. Manufactured in 1999 by A. J. Coholic. This is an interesting modification of the Tee Dee .049. The rotary valve has been replaced by a sub piston induction system, silver soldered to the cylinder. The tank is made from a thimble - picking up the "Thimble Drome" name again. A nice looking member of the Tee Dee Family with colorful, red and golden parts. In about 1973 a wire screen was added to the venturi intake to keep dirt away and to improve fuel feed. The performance is about the same as that of the .049. With these engines it was possible to use the same model in Class A and 1/2 A events. The .051 piston has a grove in its skirt. This Tee Dee came from the factory with a muffler and an R/C carburetor. To keep the muffler aligned, the red plastic part has a flap which fits into a notch on the muffler base. 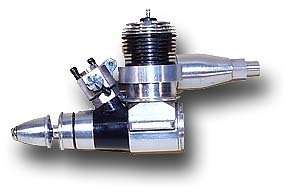 Because of the backpressure from the muffler, the cylinder has no sub-induction. 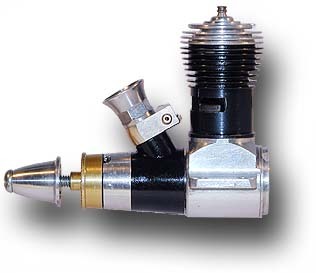 This engine of the «classic» Tee Dee Family first appeared in 1963. This engine was developed from the standard Tee Dee type by replacing the venturi carburetor with an R/C version and by adding an efficient muffler. 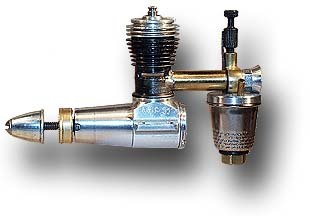 Like on the .05 R/C the cylinder does not have sub-induction. This was the first version of the .15 Tee Dee. It has a thin walled .15 cylinder with dual exhaust ports. 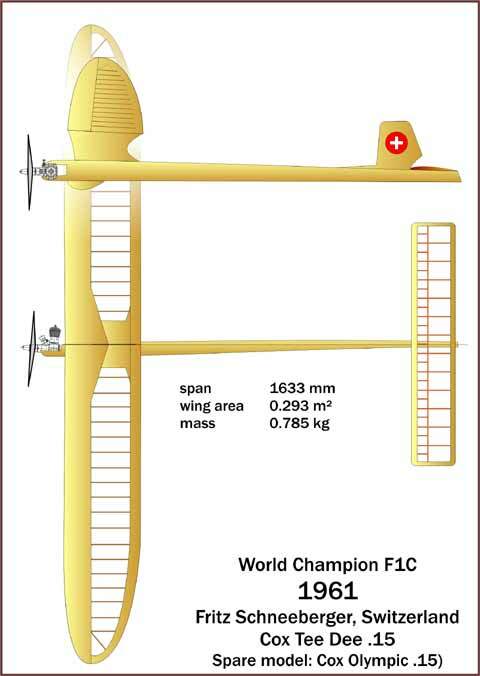 In 1961, Mr. Fritz Schneeberger (Switzerland) won the FAI free flight world championships using an engine of this type (his spare model was equipped with a Cox Olympic .15). This engine reached about 260W @ 17'000 rpm (80/20 FAI fuel) and 330W @ 18'000 rpm with 50% nitro fuel (test in Aero Modeller January 1962, an additional review can be found in MAN February 1962). The initial thin walled cylinder had fatigue problems and the ball joint inside the piston could not withstand high speeds above 20'000 1/min very well. Therefore the engines was replaced within the first production year by the improved Special .15. The Special was an improved version of the Tee Dee .15. It came with a cylinder of increased wall thickness to avoid cracks occurring due to high stress at the exhaust ports. This cylinder still had two exhaust slots. Additionally, the new cast iron piston and the new pressed aluminum conrod were now connected with a piston pin instead of the classical ball joint. Also bore and stroke were slightly altered to make full use of the allowed 2.5 cm3 swept volume limit. Finally, the inlet timing was adapted accordingly. 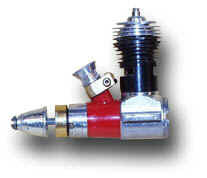 Its maximum power using a fuel having 30% nitromethane was about 340 W at 18000 1/min. 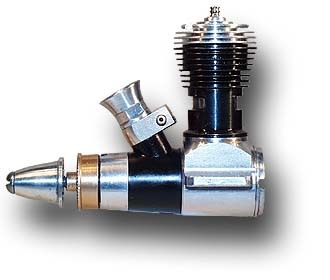 The third variation of the Tee Dee .15 came with improved performance (280 W @ 19'000 rpm using 80/20 FAI fuel), using a new, single exhaust cylinder. 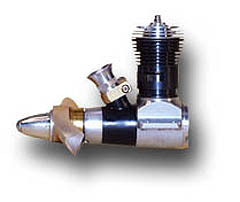 The three bypass ports resemble the directional Schnürle porting system. Other changes include a modified glow head. To distinguish it from is predecessors, the crankcase was anodized gold. The threads between cylinder and crankcase were timed so that the exhaust port always pointed to the left.